Almost exactly nine months ago, Game of Thrones fans suffered a huge blow when Kit Harington's Jon Snow was killed off in a rather heinous fashion in the Season 5 finale Mother's Mercy. 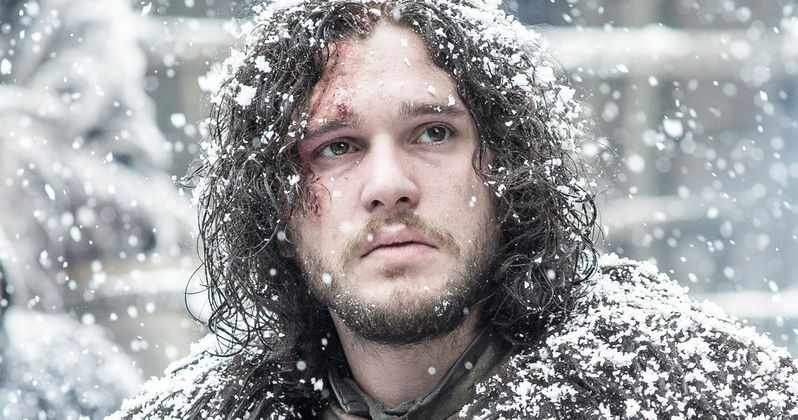 While some fans are still clinging to the hope that Jon Snow will be resurrected in some way, the full trailer released last week made it quite clear that this character will not be coming back. For those seeking closure for Jon Snow's death, Entertainment Weekly has obtained photos of the last three pages of the Mother's Mercy script, which adds some insight into this pivotal scene. The first page we see starts off with a shout-out to Game of Thrones cinematographer Robert McLanahan, with the scene described as "A signature Robert McLanahan shot, a thing of beauty, showing that night has fallen on our grim little castle." The scene begins with Jon Snow reading scrolls from various northern houses such as Hornwood, Karstark, Dustin, Umber and Cerwin, and while we can't see these passages in their entirety, it's clear that none of these houses can offer any support to the Night's Watch. For those still doubting whether or not Snow died, here is the final scene description of the script, which was written by series creators David Benioff and D.B. Weiss. "The brothers retreat, leaving Jon to die alone on the ground, bleeding out. The light goes out of his open eyes as we fade out on Season 5." Ever since this episode aired last June, fans have offered plenty of theories as to how Jon Snow could be resurrected. Some think that Melissandre (Carice van Houten) can use her supernatural powers to bring Jon back to life, but the show's cast members and producers have said on several occasions that Jon Snow is dead, and he isn't coming back. However, fans will get to see Kit Harington one more time, it seems, in Game of Thrones Season 6. The actor recently confirmed he, "filmed some scenes of me being dead," but it seems that will be all we see of the actor. Many have speculated that he isn't actually dead since he teased in September that he's still under contract with the series, which confirmed a report from October 2014 that all of the major stars had renewed their contracts through Season 7. The actor was also spotted arriving at the Belfast airport in July, and he was spotted on the Ireland set shortly thereafter. We don't know anything about the scenes he shot while on the Ireland set, or when exactly these scenes take place during the season, but it seems that he most likely was on set to film these death scenes. Aside from the trailer released last week, fans have been largely kept in the dark about Season 6 of Game of Thrones. This season will also be the first that has surpassed the books the series is based on, written by George R.R. Martin. The author's sixth book, The Winds of Winter, still doesn't have a publication date at this time, so both readers of his A Song of Ice and Fire books and viewers of the show are equally in the dark as to what may unfold in Westeros this season. While we wait for more on this new season of Game of Thrones, take a look at the script pages for the Season 5 finale Mother's Mercy.